The bearded ones and the unbearded — who as G.T. Ng suggested were following Ellen rather than James White — those in 19th century costumes, and those in modern garb, made their way to the front of the Battle Creek Tabernacle on Sabbath morning for a photo of the General Conference Executive Committee. This was their moment. It was a beautiful day for pictures, cool and crisp as a fall apple, yet sunny, so many a selfie was snapped with those in costume, or outside beneath the colorful trees, in front of the historic homes and at the pulpit from which Ellen White once preached. Jorge Molina, who was baptized during the morning sermon, got his picture taken many times. So did the family of Andy Weaver, the man who grew up within the Amish community and has, since joining the Adventist Church, helped to start the West Salem Mission to reach people from the Anabaptist tradition. The eight Weaver family children in Amish costumes were a big hit. For his hour-long sermon, Elder Ted N.C. Wilson reiterated his usual list of things to resist: worldliness, those who would neutralize a six-day creation, homosexuality, ecumenical compromises. This time it also included anti-Trinitarian heresy. He encouraged people to stand firm for a plant-based lifestyle, the spirit of prophecy, a spirit of unity. He said, “God has promised to give us his power. Are you ready for mission and to proclaim God’s last day message? Are you ready to participate in comprehensive health ministries? Are you ready to plead with the Lord for revival and reformation? Are you ready to march forward on that narrow pathway?” Before he concluded he told the story of Jorge Molina, an event planner from Guadalajara who worked with the church in putting together a number of meetings in Mexico and over several years was impressed with the biblical foundation for what he heard presented. This year he asked to be baptized and after Bible studies with the pastor of the Guadalajara Church, he was in front of the church leaders that he had come to know. In the afternoon, Artur Stele repeated his presentation on the Administrative Lessons of 1901 to 1903. Among the several lessons of that time was an interesting combination of a need for decentralization and centralization simultaneously. Decentralization because of the small number of people on the General Conference Executive Committee, but centralization for all the various entities that had separate boards and ownership. Regarding the issue of kingly power, he told the story of George Butler, a close friend of both James and Ellen White, who wrote a pamphlet on leadership, based on the theory that there is no great movement without a great leader. While Christ is the head of the church, when you have a leader chosen by God, then God works through this leader, so you better support the leader. The main job of people around the leader is to support him. To not do so is to hinder what the Lord is doing. His theory was approved with a vote at a General Conference Session. However, when James White read the document, he refused to publish it in the Review. So here was a situation where the GC Session voted and approved something that James White had refused to publish. Ellen White began to show the dangers of what Butler proposed. Stele said, “I have never seen anyone who received more harsh criticism from Mrs. White than did Butler.” In response, Butler resigned and, at the next GC Session, he moved to rescind the previous vote approving his document. Even that was not enough. He went in search of any copies of the document still available, found 960 that he burned himself so they could not circulate. Time went on. He was again elected president of the General Conference. After five years in office, the spirit of humility left him. Once again Mrs. White was writing about him having a sick man’s mind, a controlling power over the GC Committee, and the ministers being in the shadow, an echo of Elder Butler... “Elder Butler, we think, has been in office three years too long and now all humility and lowliness of mind have departed from him. He thinks his position gives him such power that his voice is infallible,” she wrote. As soon as humility departs from a leader, it is time to move on to another option, Stele said. It can be after some time or after one day, he added. Stele went on to show the extremes that marked the church in 1901, and how James and Ellen White worked to create a middle way. “Between the two extremes, of church force, and unsanctified independence, we find the grand secret of unity and efficiency in the ministry and in the church of God.” R&H Jan. 4, 1881 — an article that Stele recommended every church leader should read. By the end of the Stele presentation, I was reflecting on a comment that Bill Knott had made the day before in a conversation. He admired the vigorous way that ideas were discussed by the early editors of the Review. 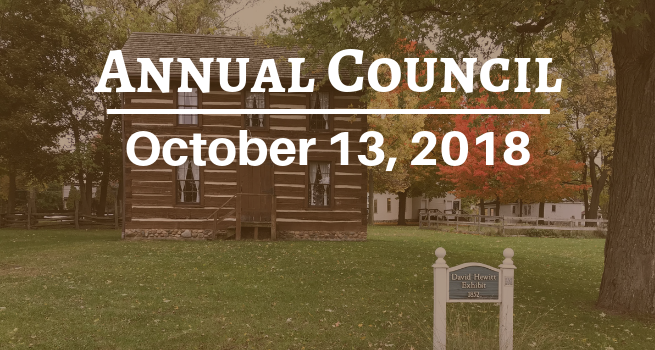 And that was what he wished would be emulated today, that the 2018 Annual Council meeting would be based on more than just being in Battle Creek and taking pictures of ourselves in costume, he wanted the ideas of Battle Creek to serve as a foundation for moving forward. Certainly, Ellen White quotations flavor ever presentation being made at this meeting of the General Conference Executive Committee. Whether or not the middle way, “grand secret of unity and efficiency” is found awaits the upcoming business sessions. Main Image: SpectrumMagazine.org. Additional photos taken by Bonnie Dwyer and Alisa Williams.